Pressures from the fast depreciating rupee and stubbornly high global crude oil prices have had their effect on retail inflation, as the adjoining chart shows. Considering that India is a net importer of crude oil, the impact of this imported inflation is expected to be significant. The Reserve Bank of India (RBI) has taken note of this several times this year and continues to warn about incipient inflationary pressures due to the twin forces of high crude oil prices and a weak rupee. As the chart sourced from the research wing of State Bank of India (SBI) shows, imported inflation surged to 9.27% in August despite a favourable base effect, given the lower inflation print of August 2017. What this signifies is that imported inflation is much worse now and obviously a large part of the blame goes to the weak exchange rate. Although the headline retail inflation for August was below the 4% target that RBI is mandated to achieve, the central bank should look through this benign print, say analysts. Much of the favourable base effect was expected by policymakers as well as market economists. 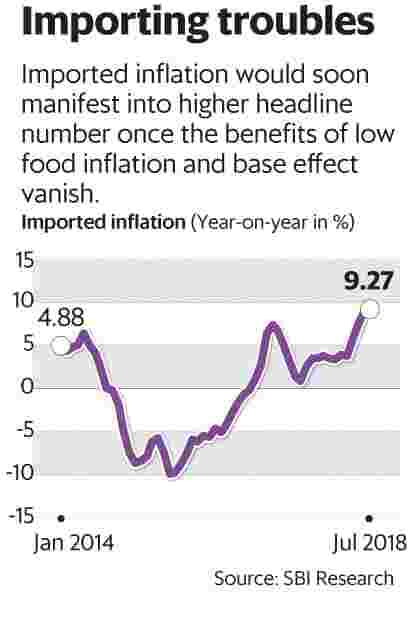 The pleasantly low food inflation is soon likely to climb once the effects of the minimum support price hike begin to trickle in. Therefore, most in the market are expecting two consecutive rate hikes by the central bank in October and in December. The unrelenting core inflation is already showing signs of higher headline numbers in the coming months. The benign retail inflation is at best cold comfort right now.